Both the Women's and Men's Singles finals at the Seamaster 2017 ITTF World Tour Qatar Open will be contested between Chinese representatives, after four of the country's players from across the two competitions came through the day's action undefeated on Saturday 25th February. Wang Manyu entered the Women’s Singles event in Doha as one of the competitors ranked outside of the top 16 seeded positions, and therefore had to negotiate qualification matches prior to reaching the main draw. The Chinese player Wang Manyu kicked-off her Day Three campaign in style as she eliminated the no.6 seed Mima Ito in the quarter-finals (11-3, 11-9, 11-5, 8-11, 11-6). Another player from China, who also had been forced to undergo the qualifying rounds in Doha, Gu Yuting was awaiting Wang Manyu in the last four. Gu Yuting headed into the tie with confidence having beaten the third seed Feng Tianwei of Singapore in the previous round (11-8, 11-6, 11-5, 14-12), but it was Wang Manyu who came through the semi-finals encounter in five ends (11-6, 20-18, 11-6, 7-11, 11-6) to book her spot in the final. “… I really had to stay focused and not think of the results, because that would have distracted me. Each point at that time, I had to think of how I’m going to tackle each ball and to think about the process, that helped me to concentrate on the match”, Wang Manyu. The other tie in the last four saw China’s Chen Meng go up against Shan Xiaona, as the no.9 seeded competitor took on the 16th seed representing Germany. Shan Xiaona’s pen-hold grip style had proved successful against the top seed Zhu Yuling on the previous day at the competition, but the technique was dealt with calmly by Chen Meng as she stormed to a straight games victory over her opponent (11-4, 12-10, 11-5, 11-3). While the Women’s Singles competition is set to feature a slightly unexpected pair of finalists, the case couldn’t be further from the truth in the Men’s Singles category as the top two seeded players Ma Long and Fan Zhendong successfully sealed their involvement for the final day of action. 20-year-old Fan Zhendong faced tough opposition in the penultimate round of the tournament, as his match against Fang Bo went right down to the wire. In what turned out to be an end-to-end battle Fang Bo looked to be setting up a dramatic finale to the tie when he saved three match points in game six before going on to force a deciding game. However, Fan Zhendong held his nerve and his capture of the seventh game was enough to send him through to the next stage (9-11, 11-3, 12-10, 5-11, 11-6, 13-15, 11-8). “… In the decider, I had a good start, and wasn’t affected by the loss of the sixth game, I think that’s something that I did well in this match”, Fan Zhendong. Ma Long will meet Fan Zhendong in the final as the Ali Bin Hamad Al Attiyah Arena prepares to yet again host the two stars in a head-to-head showdown. 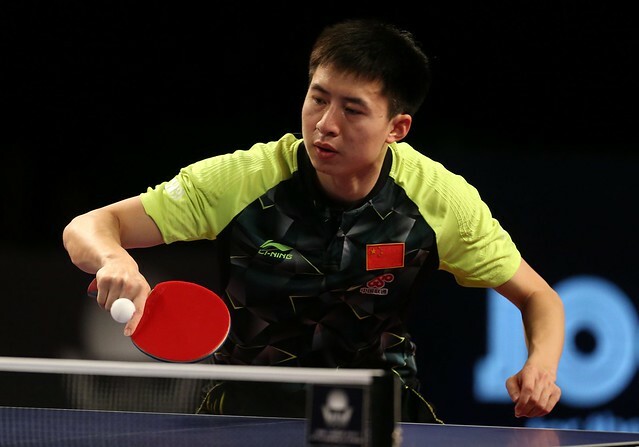 The two players met in the Men’s Singles final at the Seamaster Qatar 2016 ITTF World Tour Grand Finals where Ma Long came out on top to seal the trophy. Now the World no.1 Ma Long will have another opportunity to repeat that success at the Seamaster 2017 ITTF World Tour Qatar Open, after he overcame Chuang Chih-Yuan of Chinese Taipei in their Day Three semi-final encounter (11-8, 11-8, 11-6, 11-4).